↑ The IOC attributes Théato's medal to France, despite later sources finding that his nationality was لکسمبرگish. ↑ Corey is described in the 1904 Games report as a "Frenchman wearing the colors of the Chicago Athletic Association", but the IOC attributes his medal to the United States. ^ ا ب Both Sohn Kee-chung (Son Kitei) and Nam Sung-yong (Nan Shoryu) were from Korea. The IOC attributes both medals to Japan due to Korea being a کوریا جاپانی تسلط میں at the time. 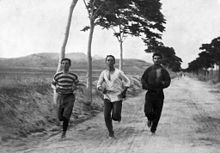 All Korean Olympians during the Japanese colonial rule could only participate in the games as a representative of Japan and had to compete with Japanese names instead of their original Korean names. However, some sources still refer to Son Kitei as the first Korean to win an Olympic marathon today.